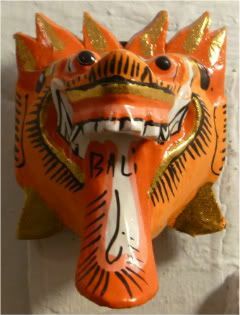 My friend bought this dragon magnet for me in Bali. Pretty darn cool, methinks. I had no idea that Komodo Dragons are native to Indonesia. I also didn't realize that the adults can be as big as me!!! And they're carnivores who can take down big animals with one bite! Obviously, this means that I will not be visiting Bali for any of those daytrips or visits to their National Park to see these buggers. Yowzers. That'll make my mom a little sad, since she really wants me to meet that American CEO dude on that HGTV show living in Hong Kong but house-hunting in Bali. Yep. My mother. Still searching for my perfect soulmate. Only now the candidates are from television. I've mentioned that I'm back home for a while, taking care of my parents in a post-heart attack world. The New Normal, is what we're calling it. It's a world that's both more gentle and more harsh, as we're more gentle and more harsh with each other. A world where we're monitoring meds, diets, sleep schedules and exertion (no, not exercise - yet). A world where we're thinking procedure to procedure. A world where we worry about every little stressor and forgive a lot a heck of a lot more than we normally would. A world where I'm running pick-up/drop-off for the parents, not the other way around. But, The New Normal is also a world that includes both my parents right now, and for that, it's still a pretty good world. Funny, because I feel like the last two years have been nothing but the redefining of The New Normal. When the group I was working with got absorbed into a new company, that became The New Normal. When half of the older employees in the group were laid off in the subsequent couple of years, not knowing if we were all going to have jobs by the end of each day, that became The New Normal. When I was laid off for writing memos expressing my displeasure with the company we'd become and how to fix it, and I became a temporary "Woman of Leisure," that became The New Normal. When I started living my life up and down 95 (/tm Julie), driving my parents up and down the eastern seaboard for my dad's eye surgeries, that became The New Normal. When my apartment building was bought and I joined our tenants association writing minutes and suddenly caring about rent laws (because they now applied directly to me), that became The New Normal. When I started doing freelance work this year, that became The New Normal. But so now, as we try and settle into yet another The New Normal, my question is, when does The New Normal become the everyday? I had to include this Komodo Dragon video. FREAKS. ME. OUT. Gentle giants they are not!